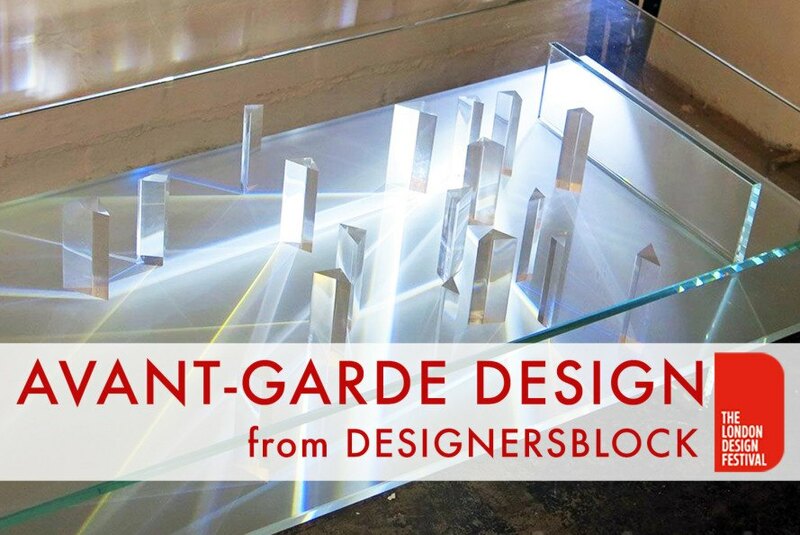 Avant-grade artists have turned ordinary materials into new innovative furnishings at one of Inhabitat’s favorite design events, Designersblock. Currently on show at The Bargehouse, a 40-story-tall raw warehouse space, Designersblock has pulled out all the stops with a display of fascinating cutting-edge creations from emerging local and international designers. We visited the London Design Festival event to see the latest in furniture innovation, from upcycled jewelry to an amazing rainbow prism table. 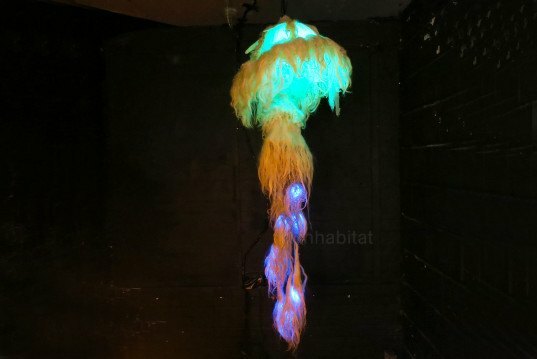 Austrian designer Yulia Badian creates hairy, marine-inspired lamps handcrafted from felt. Her biodegradable designs use greyface Dartmoor’s sheep hair, valued for its straight, long and very soft qualities. 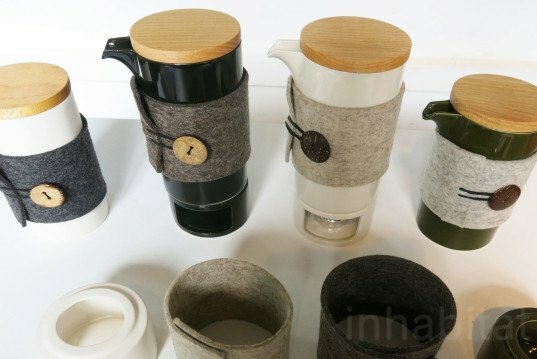 London-based Japanese designer Sayoko Shibuya‘s ‘Teapot Mug’ set is made from ceramic, wood and wool. Blending Japanese and British cultures, the collection takes advantage of the three materials’ insulating properties. German architect turned designer Constanze Schweda produces elegant, timeless furniture inspired by Kirigami, the Japanese paper art. Her sculptural collection includes tables, seats, mirrors and lamps, all made by turning flat sheets of metal into three-dimensional furniture. 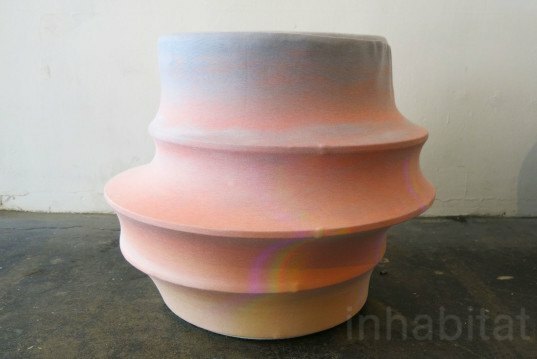 British designer and ceramist Taz Pollard creates striking ‘ceramic with attitude’. 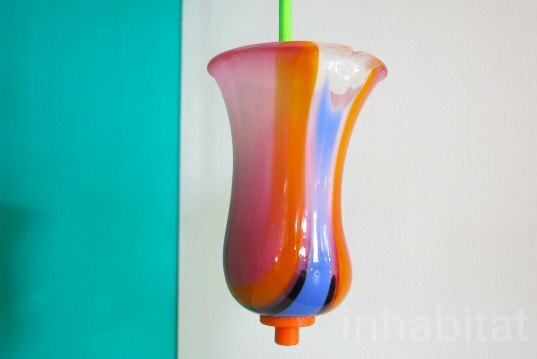 She casts discarded materials like plastic bottles and old pipes, and then combines the composite with new elements like plastic cable ties and ribbon to create quirky and vibrant items for the home. 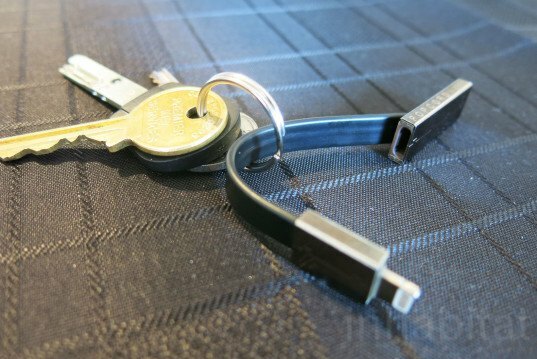 Frank Milani‘s clever ‘Popcord’ is a tiny, elegant key ring that doubles as a Smartphone charger (for iPhones or Android). The stylish and convenient device comes in many different colors. Israeli designer Shai Albojm is passionate about jewelry and recycling. Her latest accessories line includes necklaces and bracelets playfully made from old 1980s calculator watches and silver. British artist and blacksmith Alex Barratt makes unique hand-blown luminaries with psychedelic patterns. Each lamp is equipped with energy-efficient bulbs and is crafted from leftover and recycled factory glass. Fresh graduate Josh Ino‘s ‘Cloud Envy: 2015’ takes inspiration from the ethereal shapes of clouds. The playful seat that moves when someone sits on it is wrapped in a stretchy sky-printed fabric and has a soft recycled chipboard foam core. Canadian artist Jordan Soderberg Mills unveiled a brilliant table that is ‘as close to magic as we can get’. Particularly interested in physics, he uses the natural science to create enchanting glass and acrylic furniture that plays with light and creates sweet rainbows. British ceramic artist Charlotte Mary Pack has a passion for all creatures but her tiny delicate work draws attention to endangered animals. Her 198-species collection called ‘No Time for Tea’ includes rats, bats, sloths, wild dogs and lemurs, which she fixes into very cute tableware. Japan-born, London-based designer Yuki Uebo created ‘Speakers’ Corner Ring’, a crawly design that challenges the conventional unilateral communication at London’s iconic park corner. 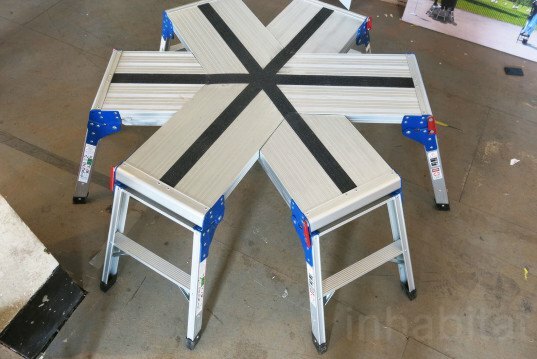 Made by linking several ladders together, the piece allows up to 6 people to stand in a close circle for discussion. Swedish designer Kristina Schultz showcased ‘100 days of need and greed’, a hand-made collection of objects for the home that she, her partner, and daughter crafted after emptying their home of stuff. 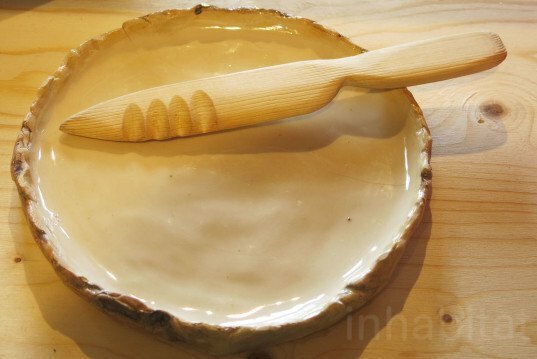 Hand-carved spoons, imperfect ceramic containers, low recycled fabric seats and even felt animal toys are all part of a unique functional collection. Silkfest by Yulia Badian Austrian designer Yulia Badian creates hairy, marine-inspired lamps handcrafted from felt. Her biodegradable designs use greyface Dartmoor's sheep hair for their straight, long and very soft qualities. Teapot Mug by Sayoko Shibuya London-based Japanese designer Sayoko Shibuya's 'Teapot Mug' set is made from ceramic, wood and wool. Blending Japanese and British cultures, the collection takes advantage from the three materials' insulating properties. Kirigram by Constanze Schweda German architect turned designer Constanze Schweda produces elegant, timeless furniture inspired by Kirigami called Kirigram, the Japanese paper art. 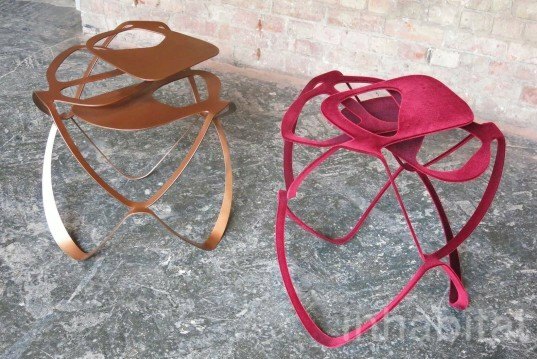 Her sculptural collection includes tables, seats, mirrors and lamps, all made by turning a flat sheet of metal into a three-dimensional furniture piece. The Designersblock exhibit takes up residence in a 4-storey raw warehouse space called The Bargehouse at this year's London Design Festival. Famous for displaying avant-garde creations from emerging local and also international designers, the event masterminded by Rory Dodd and Piers Roberts is as always, fascinating this year. Read on to discover furniture that makes rainbows, a key ring-phone charger, jewelry made from old kids' watches and brilliant lamps like Sayoko Shibuya's hanging 'Blue'. Ceramic with attitude by Taz Pollard British designer and ceramist Taz Pollard creates striking 'ceramic with attitude'. 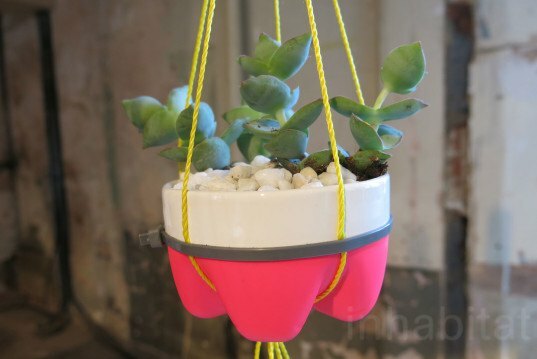 She casts discarded materials like plastic bottles and old pipes combining it with new elements like plastic cable ties and ribbon to create quirky and vibrant items for the home. Popcord by Frank Milani Frank Milani's clever 'Popcord' is a tiny, elegant key ring that doubles as a Smartphone charger (for iPhones or Android). Always with your keys so you never forget it at home, the stylish device comes in many different colors to choose from. 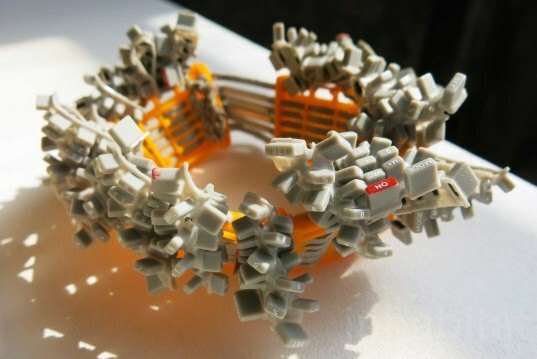 Recycled Jewelry by Shai Albojm Israeli designer Shai Albojm is passionate about jewelry and recycling. Her latest accessories line includes necklaces and bracelets playfully made from old 80s calculator watches and silver. Recycled Glass lamps by Alex Barratt British artist and blacksmith Alex Barratt makes unique hand-blown luminaries with psychedelic patterns. Featuring energy-efficient bulbs hanging from a bright fluorescent cord, each lamp is crafted from leftover recycled glass from a factory. Cloud Envy: 2015 by Josh Ino Fresh graduate Josh Ino's 'Cloud Envy: 2015' takes inspiration from the ethereal shape of clouds. The playful seat that moves when someone sits on it is wrapped in a stretchy sky-printed fabric and has a soft recycled chipboard foam core. Magical Lamp by Jordan Soderberg Mills Canadian artist Jordan Soderberg Mills unveiled a brilliant table that is ‘as close to magic as we can get’. 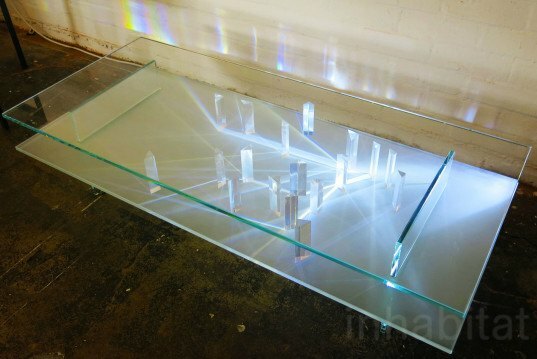 Particularly interested in physics, he uses the natural science to create enchanting glass and acrylic furniture that plays with light and creates sweet rainbows. No time for Tea by Charlotte Mary Pack British ceramic artist Charlotte Mary Pack has a passion for all creatures but her tiny delicate work draws attention to endangered animals. Her 198-species collection called 'No Time for Tea' includes rats, bats, sloths, wild dogs and lemurs, which she fixes into some very cute tableware. Speakers’ Corner Ring by Yuki Uebo Japan-born, London-based designer Yuki Uebo created 'Speakers’ Corner Ring', a crawly design that challenges the conventional unilateral communication at London's iconic park corner. Made by linking several ladders together, the piece allows up to 6 people to stand in a close circle and discuss news or stories. 100 Days of Need and Greed by Kristina Schultz Swedish designer Kristina Schultz was showcasing '100 days of need and greed', a hand-made collection of objects for the home that she, her partner and daughter crafted after emptying their home to see how it feels. 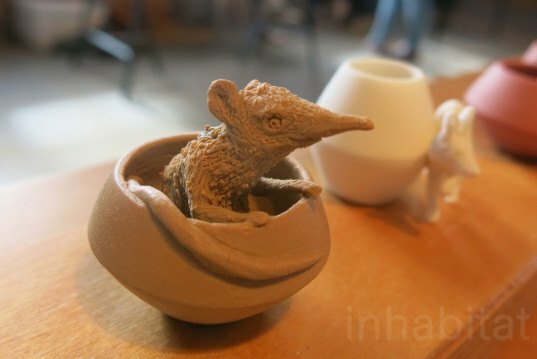 Hand-carved spoons, imperfect ceramic containers, low recycled fabric seats and even felt animal toys are all part of a unique functional collection.